CS-Cart “Shipping availability” add-on adds a shipping availability message on a product details page. It allows customers to know how fast the product will be shipped. Also, administrator can give any extra information regarding shipping. A shipping availability message (e.g. “This product will be shipped in 3 business days”, “Shipping within US only, ships in 24 hours”, etc.) is shown above the Quantity box on a product details page. A shipping availability message is shown on the product list, cart contents page, in the invoice, on the order details page. Separate admin page to create, edit and delete shipping availability messages. Message can be edited in WYSIWYG and HTML editor. Ability for administrator to assign a message to a certain product. Ability to bulk edit availability statuses. Notice! You can use this add-on to add any kind of message above the Quantity box on a product details page. The add-on is compatible with CS-Cart Professional/Multi-Vendor/Ultimate 3.0.x, 2.2.x, 2.1.x, CS-Cart 4.0.x -4.5.x. 1. We offer free installation of this add-on for the default CS-Cart versions (that don't have any file changes and additional modules). Otherwise, the installation may require additional charge. Where to create "shipping availability" messages? 1. After the add-on installation go to Products -> Availability statuses. 2. Click "Add status" button on "Availability statuses" page. Title - the title of the message that will appear in the select-box on product editing page. 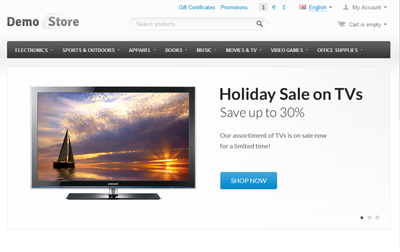 Description - message that will be displayed on product details page in the storefront above Quantity box. Status - choose Active and shipping availability message will be displayed in the storefront after enabling it for a certain product. Choose Disabled and it will not be possible to display this message in the storefront. Don't forget to press "Create" button. 4. All created availability statuses will be available on "Availability statuses" page (Products -> Availability statuses). It is possible to delete and edit availability statuses on this page. How to enable a shipping availability message for a certain product? 1. Go to Products -> Products -> click necessary product. 2. 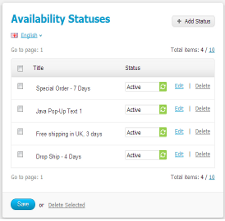 On product editing page (General tab) you will see an "Availability status" select-box. 3. Choose the necessary status for this product. 4. Don't forget to save changes. How to bulk edit availability statuses? It is possible to bulk edit availability statuses via Global update. 1. In the admin back-end go to Products -> Products, click Global update link on top of the screen. 2. Choose the necessary Availability status in the appeared window and add the products where you would like to apply this status. 1. Download the archive with the Shipping availability add-on. 4. In the list of add-ons find the Availability statuses add-on and click Install opposite to its name. 3. Log into the administration panel of your store, go to the Add-ons -> Manage add-ons page. 4. In the list of add-ons find the Shipping availability add-on and click Install opposite to its name. "Super add on. Works perfectly."